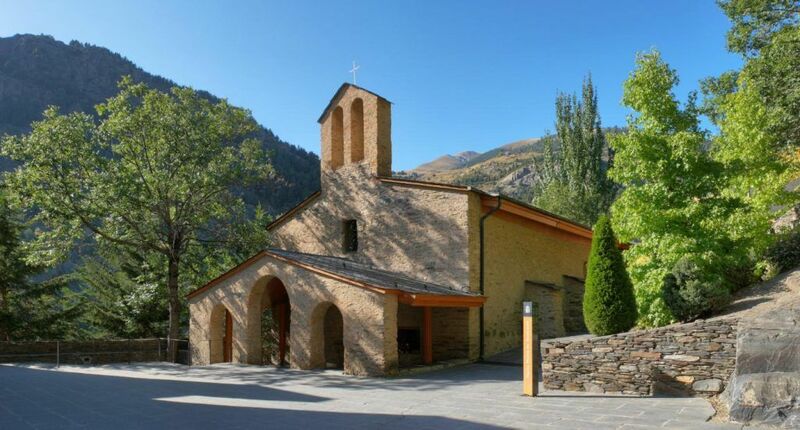 In the Principality of Andorra, surrounded by privileged scenery and enclosed in a landscape of great natural beauty, the sanctuary of Meritxell emerges between mountains as a symbol and source of passion of a whole nation. The pope Francis granted the Sanctuary the title of Minor Basilica, in honour of its singular liturgical life, its religious work and its history and cultural activity. The Historic Ensemble of Meritxell is comprised of two buildings: the old Sanctuary and the new, both of them declared heritage of cultural interest. 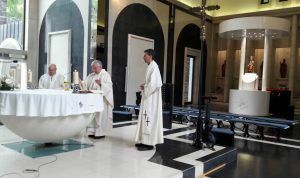 The pope Francis granted the Sanctuary the title of Minor Basilica, in honour of its singular liturgical life, its religious work and its history and cultural activity. This recognition gives at Meritxell an incalculable religious value, the worship place most important in Andorra. In 1972, during the night of September 9th and just a few hours after the celebration the holiday in honor of the Virgin of Meritxell, a fire destroyed the sanctuary. The only part that remained standing was a section of the church façade and some other walls. That very same day, the ‘General Board’ decided that the sanctuary had to be built again from scratch. The construction of the new building was put in charge to architect Ricardo Bofill. The project had to transmit greatness, monumentality and religious strength. The project was based on three pillars: faith, identity and culture. All those concepts had to be integrated in the scenery, while being at the service of religion and culture. The original project included a great complex with buildings and elements that in the end were not erected. The current building was inaugurated in 1976. It is a design of a modern sanctuary of eclectic conception, as some scholars pointed out, its construction reminds of constructions of other times. For some of these specialists, the bell tower looks similar to the ones present in many medieval monasteries in Southeast Europe. Also they find similarities with the Islamic (i.e. : the great visible openings present in the sanctuary, as well as by the presence of water in the cloister of mirrors). These two factors strengthen the attempt to establish a harmony between the work of men with the surrounding area. On the other hand, the great white stone and slate arcs remind the ones left after the fire and that were part of the old church. However, the interpretation made from the architect studio, adapting to the new builing the Pyrenean architectonical past is the result of the ‘interpretation of the Romanesque architecture theoretic principals within a modern design’. 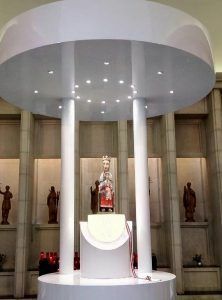 Inside, the Altar is placed in the center of the church. It has a circular shape. The Image is a reproduction of the carving of the Virgin of Meritxell done by a workshop of Olot, according to the canons of the romanesque disappeared after the fire. This image is a faithful copy of the original. On the top part, the visitor can see the statues of the seven Presiding Saints of the Andorran parishes. The presence of these saints in the temple remarks the importance of Meritxell as a National Sanctuary. 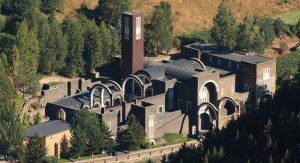 The Sanctuary of Meritxell complex has been declared of Cultural Interest for the Goverment of Andorra. The image that can currently be seen in the sanctuary is a faithful copy or duplicate of the Romanesque carving disappeared the night of September 9th 1972, and made from photographs of the original with the most advanced technology (laser system). The holly image that disappeared due to the fire was a Romanesque carving of the 12th century. Experts claim that it was one of oldest of that Pyrenean area. Sitting solemnly in hieratic attitude, holds baby Jesus in her lap, who raises his left hand, just as the Mother does. She wore a five rosette crown in her head and over a white veil that covered head and shoulders. The mother had the right hand exaggeratedly long (emphasizing the welcoming action and the sign of blessing), just like many other images carved in that period. They are known as the “with a long hand”. The baby Jesus, who repeats the gesture of the Mother, goes barefoot unlike the mother who wears the typical wooden flat shoes that mountain farmers used to wear. The Holy statue is a faithful reproduction of the old one. It emphasizes three key characteristics of the medieval stature: The position of the Mather, symbolizing the protection given by a mother to her children; The Mother´s eyes are shown in an exaggerated way. They express spirituality and eternity. The unnatural disproportion represents the true and transcendent reality of the divine. These imperfect and attentive eyes give the message that even when the visitor is not looking, she is looking at them; and finally, the shoes she is wearing, the typical wooden flat shoes that mountain farmers used to wear. There is not much information regarding the old church. However, experts are quite sure of the period when the Romanesque image of Saint Mary of Meritxell was carved (12th century). Based on this, this experts estimate that the primitive chapel belonged to the same period or even older. This would not be strange, since it has happened in other sanctuaries. The construction of the church took place before placing the image of the Virgin. This Romanesque construction was transformed during the Baroque period. It was quite modest temple of a single nave, with a semicircular apse. Only the west wall of the Romanesque building has been preserved and it was integrated within the Baroque building. An archeological dig took place in 1991 that showed those Romanesque elements that had been integrated in the Baroque church. Future excavations will be necessary to determine the exact time when that chapel was erected. 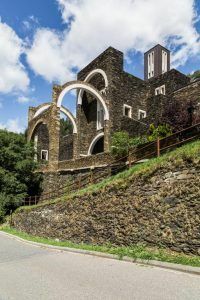 However, with information that we have now, it can be confirmed that Meritxell was the first location in Andorra where an image of the Virgin was venerated and the first place where a church was erected to honor the Blessed Virgin Mary. The Virgin of Meritxell carving was kept in this old church until 1972, when during the night between September 8th and September 9th, a fire destroyed the sanctuary (the one that we know as ‘the old sanctuary’). The building that had practically been devastated by the fire was partially reconstructed. 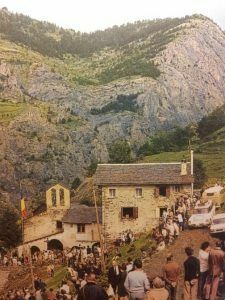 Nowadays is used as an exhibition space and is currently featuring ‘Meritxell Memory’ a retrospective exhibit that reflects through pictures, documents and objects the history of the cult to the patron Saint of Andorra. The progressive increase of the devotion and admiration towards the Virgin throughout the 19th and 20th centuries, together with other circumstances such as embracing the national feeling by the inhabitants of Andorra, made the General Council of valleys of Andorra declare the Virgin of Meritxell the patron Saint of the Andorra Valleys. The declaration took place on October 24th 1873 by unanimous decision: “Acknowledged the fact that Our Lady of Meritxell is considered by Valleys of Andorra as their patron saint and special protector from immemorial times”. Years later, the continued support of the different bishops/co-princes of Meritxell, together with that fervor and popular tradition that already had been developed with time, made possible the canonical declaration of the Patronage of the Virgin of Meritxell. It was the bishop Joan Benlloch Vivóla made the request onAugust 23th 1913. It did not pass unnoticed the fact that, since the proclamation as patron saint (1873) to its Church recognition (1914, a year after its request), more than forty years passed by. The tumultuous and scrambled period of those years, together with the tensions between the bishop of Urgel and the governors of Andorra caused that it was necessary to wait for such a long time for this recognition. The Holly See, via Pope Pío X, confirmed the Virgin of Meritxell as patron saint of the Andorran people in 1914. The Council, joyful by the news, wanted that this moment would be solemnized and decided that every September 8th would be celebrated the National Festival of the Valleys. Years later, the bishop from Barcelona Dr. Justí Guitart i Valardebò wanted to complete the work of its predecessors and worked in favor of the canonical coronation of the Virgin as patron saint of Andorra. The recognition process concluded the 8 of September of 1921. The faculty to grant this privilege fell to the basilica of Saint Peter of Rome. 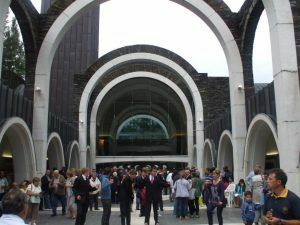 At the present time, each 8 of September, the Andorran people live a celebration on unity and harmony. A celebration where the Virgin is the absolute protagonist. Everything goes around Meritxell, everyone´s virgin. That day, thousands of people go on pilgrimage to the sanctuary, from early in the morning, to thank and to show their feeling of joy and enthusiasm. People kneel down before the virgin in a physical and spiritual way. The power of attraction of Meritxell is quite obvious in a day like that and it is lived as such. Several events and celebrations (concerts, dancing of ‘sardanas’ (traditional dance), Eucharist, local products tasting…), are a good frame on a day like this, in which traditions and celebration fill of joy the Meritxell complex. It’s possible to book a guided visit free the sanctuary. Service available from May to October.